The Unit Gothic series was released by Hamilton Manufacturing Co. in 1907. This sans serif family features one of the first multi width/weight type 'systems', anticipating the Univers font system by 50 years. This set of 7 fonts was designed to aid in press room efficiency and its incremental variation in widths gave poster printers unprecedented flexibility in fitting copy while using consistently harmonious fonts. This HWT release is the first ever digital version of these fonts. Each font contains 600 glyphs including Greek and Cyrillic character sets as well as alternate characters which are based on the actual special character production patterns from the Hamilton Wood Type Museum collection. David Shields has written an essay for Slanted Magazine that gives a closer look at this font system and its place in history. Follow this link to read the article online. View more details about this release here. Individual Pro font prices start at $39.95. 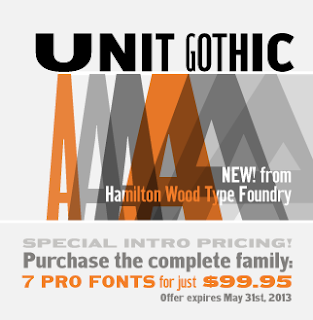 Order the full Unit Gothic family for a special intro sale price of only $99.95 (for all 7 fonts). This offer is good through May 31, 2013. To view images, source materials and additional information regarding this release and other HWT fonts, visit the Hamilton Wood type Foundry, here.